These incredible works of art are created by British artist Simon Beck while wearing snowshoes and come in a range of designs from snowflakes and spirals to cubes and more abstract creations. 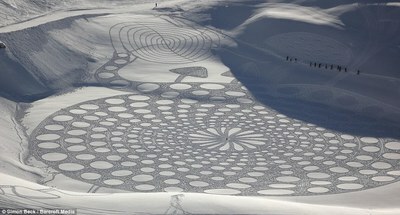 Each pattern is crafted by Mr Beck alone in the skiing town of Les Arcs, in the French Alps, where he lives during winter. And he uses an orienteering compass to create the perfect geometric designs. Mr Beck, an orienteer leader, has created hundreds of the artworks after ploughing his first at Christmas in 2004. He uses what he describes as a ‘kind of reverse orienteering’ to plot his intricate paths before walking along the route in a pair of snowshoes.